This is the modern version of Dressage showing the 'competition trot' with the front leg overextended and not parallel with the hind leg, plus the horse's head is behind the vertical. Notice the horse's rump high and not rounded - the horse is on his forehand and cannot make use of his backend for thrust. He is being ridden from front to back instead of back to front as in Classical Dressage. 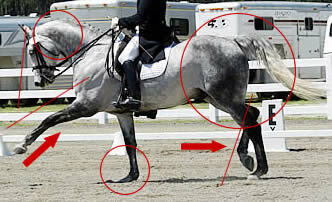 He may have been trained using hyperflexion (roll kur) techniques. October 26, 2009 – The FEI is aware of the video filmed at the FEI World Cup Dressage qualifier at Odense (DEN) and posted on YouTube by Epona TV at http://www.youtube.com/watch?v=8hIXGiV4N4k. FEI’s main concern has always been and will always be the welfare of the horse. We are taking the issues raised in the video and in the comments made by members of the public on social media and by email very seriously and have opened a full investigation. The conclusions of this investigation will be made public in due course. Please read Dr. Gerd Heushmann’s book “Tug of War” and see his DVD “If Horses Could Speak” about the dangers of using this method of training and the long term effects of forcing horses to be hand ridden, ridden incorrectly from front to back which is is SUPPOSED TO BE as in Classical Dressage – from back to front, and pushing young horses into doing Dressage levels at too young an age before they have completely developed. I had posted that I interviewed him last week and will be posting more on this in the very near future. Click below to purhcase his book and DVD. See previous blog post: http://horsesinthesouth.com/blog/index.php/2009/10/28/dr-gerd-heuschmann-author-of-tug-of-war-dvd-if-horses-could-speak-lecture-clinic/ . Click on this link http://www.youtube.com/watch?v=TahYWzsCdQM to watch a YouTube excerpt from his DVD which you can purchase from the Amazon.com link above. This should be ‘required reading’ for all of those who compete and for judges, if you do not know the true form of Classical Dressage or riding the horse from back to front to have a happy horse! British Horse Society chairman Patrick Print has since written to HRH Princess Haya requesting the FEI launch a second investigation into the practise of hyperflexion. Forums are rife with angered comment on the topic and several facebook groups have been set up in condemnation of rollkur. The Classical Riding Club have also written to the FEI and are urging all members to sign their petition to the FEI to ban all hyperflexion in competition. More to come on this important issue! !